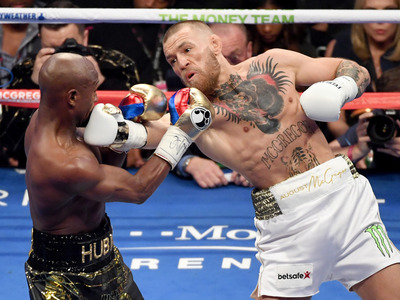 Getty ImagesFloyd Mayweather (left) and Conor McGregor (right) fought a landmark bout in 2017. But his comeback fight in UFC could be even bigger – provided he fights Georges St-Pierre. A fight between Conor McGregor and Georges St-Pierre would be the biggest fight of all time, according to St-Pierre’s coach Firas Zahabi. Getty ImagesGeorges St-Pierre (left) trains with Firas Zahabi (right). A fight between the UFC’s two double champions would certainly make history, but for Zahabi there is only one winner. “Georges is fully aware of the karate stuff, taekwondo ranges, and the distances McGregor uses,” Zahabi said. “He grew up in that. McGregor is very good at keeping distance and when you cross that distance he punches you. Georges understands that game so well. Plus Georges is much more schooled in boxing, wrestling, and jiu-jitsu. So I put it all on Georges side.